Find hotel near State Museum Of Madhya Pr .. 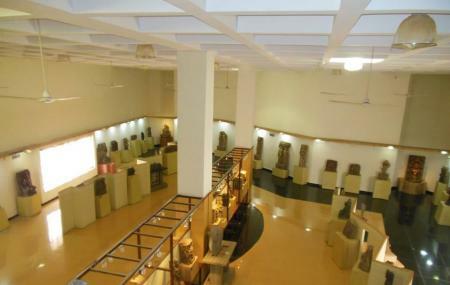 Formerly known as Bhopal Museum, the State Museum conveys the history, struggle and culture of Madhya Pradesh through historical artefacts, fossils, pre historic collection found near the surrounding caves, sculptures and the textiles famous to the state. The collection belonging to the royal family is the highlight of the place while the weapons, instruments and miniature exhibits are just as stunning. Bronze statues dating from the 8th to the 11th century. By Bus: MPSRTC Bus Depotor at JawaharChowk City Bus Station. How popular is State Museum Of Madhya Pradesh? People normally club together Indira Gandhi Rashtriya Manav Sangrahalaya-National Museum Of Mankind and Bhadbhada Dam while planning their visit to State Museum Of Madhya Pradesh. An extensive collection of sculptural art from several ages, collected from all over Madhya Pradesh. Also a lovely section dedicated to manuscripts and original documents and letters from 19th and early 20th century. Amazing. Have wonderful collection of ancient artifacts and sculptures.